The Lions rank 10th in the league with 231.3 passing yards allowed per game. 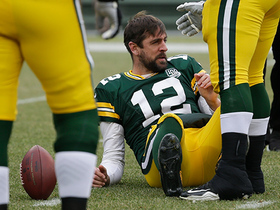 They play the Packers in Week 17. The Lions have held their last four opponents below 230 passing yards. They play the Vikings in Week 16. The Lions have held four of their last five opponents under 100 rushing yards. They play the Bills in Week 15. The Lions rank 26th in the league with 26.3 points allowed per game. They play the Cardinals in Week 14. The Lions have kept their last three opponents under 56 rushing yards. They play the Rams in Week 13. The Lions are tied for 10th in the league with 28 sacks. They play the Bears in Week 12. The Lions have forced two turnovers over the last four weeks. They play the Panthers in Week 11. 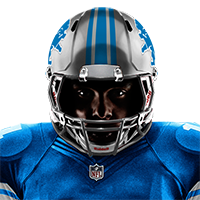 The Lions have allowed over 100 rushing yards in each of the last three games. They play the Bears in Week 10. The Lions have allowed eight passing touchdowns in the last three games. They play the Vikings in Week 9. The Lions acquired DT Damon Harrison on Wednesday. They play the Seahawks in Week 8. The Lions have only allowed one quarterback to throw for over 260 yards this season. They play the Dolphins in Week 7. SS Quandre Diggs fractured his hand in Week 4. 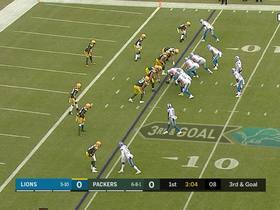 The Lions face the Packers in Week 5. The Lions allowed 10 points and 209 total yards in Week 3's loss to the Patriots. They'll play the Cowboys in Week 4. The Lions lost to the 49ers 30-27 in Week 2. They'll play the Patriots in Week 3. CB Nevin Lawson is in concussion protocol ahead of Sunday's game against the Packers. DE Ezekiel Ansah (ankle) is fully healthy to play Sunday against the Bengals. CB Nevin Lawson is ill ahead of Saturday's game against the Bears. DE Ezekiel Ansah continues to battle an ankle injury ahead of Sunday's game against the Buccaneers. CB Jamal Agnew (knee) has been ruled out for Sunday's game against the Ravens. Ezekiel Ansah (back) is listed as questionable for Thursday's game against the Vikings. DE Ezekiel Ansah continues to deal with a knee injury ahead of Sunday's matchup with the Bears. Analysis: The Bears are equipped with two stud running backs -- Jordan Howard and Tarik Cohen -- but the Lions ninth-ranked run defense looks ready for the matchup. Chicago enters this game with 16 turnovers; however, they've given up only two in the last three contests, showing improvements with rookie QB Mitchell Trubisky. 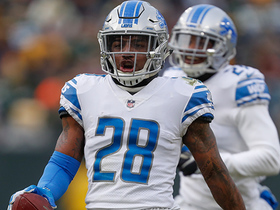 The Lions' defense may bend a little bit against in a tough road matchup, but they're skilled enough to keep the Bears out of the end zone and produce a top-tier fantasy performance. DE Ezekiel Ansah is nursing a knee injury ahead of Sunday's contest against the Browns. The Lions are headed to Green Bay for a Monday night game. 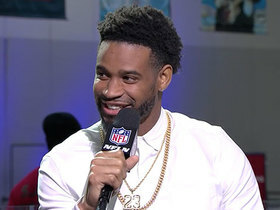 Detroit Lions cornerback Darius Slay Jr. joins "Super Bowl Live" to talk about why the Detroit Lions struggled in the 2018 season. 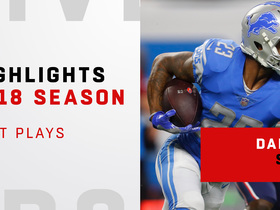 Watch Detroit Lions cornerback Darius Slay's best plays in the 2018 season. Detroit Lions defensive back Quandre Diggs intercepts Green Bay Packers quarterback DeShone Kizer. Green Bay Packers quarterback DeShone Kizer rushes for a 12-yard gain. 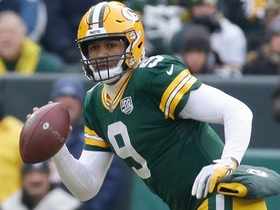 Green Bay Packers quarterback DeShone Kizer finds wide receiver Randall Cobb for a 27-yard gain. 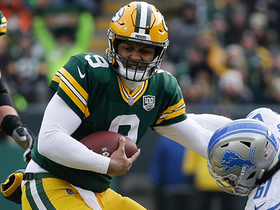 Green Bay Packers quarterback DeShone Kizer rushes for an 11-yard gain. 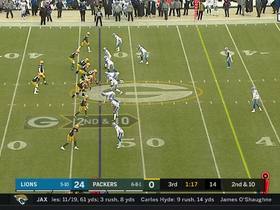 Detroit Lions linebacker Jarrad Davis sacks Green Bay Packers quarterback Aaron Rodgers for a loss of 12 yards. 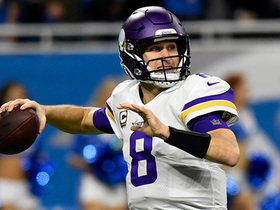 Minnesota Vikings wide receiver Adam Thielen catches a 40-yard pass from quarterback Kirk Cousins. 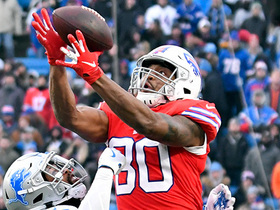 Buffalo Bills quarterback Josh Allen lofts perfect pass to tight end Jason Croom.